Turin has played, and continues to play, an important part in the narrative of modern art history in Italy. For example, it was the first Italian city to foster a public collection of modern art as part of its Civic Museum, in 1863. As a result, the city’s leading galleries and museums house impressive collections. Here are five masterpieces and where to find them. The Birth of John the Baptist (1422) is an exquisite miniature that forms part of the famous illuminated manuscript Turin-Milan Hours (c.1450). Jan van Eyck (1390–1441) was one of many artists to contribute to this special Book of Hours, a Christian devotional book popular in the Middle Ages. It is one of only two surviving miniatures by the Belgian artist who is commonly thought of as one of the finest oil painters of the medieval period. 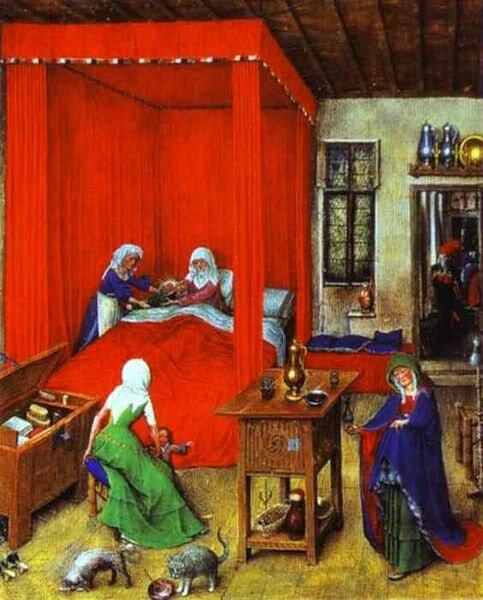 The Birth of John the Baptist is a rare example of van Eyck using watercolour. The level of pictorial and narrative detail in this tiny masterpiece is typical of the artist and a testament to his technical sensibilities. Boijmans offer a great summary of the work and its tumultuous history here. 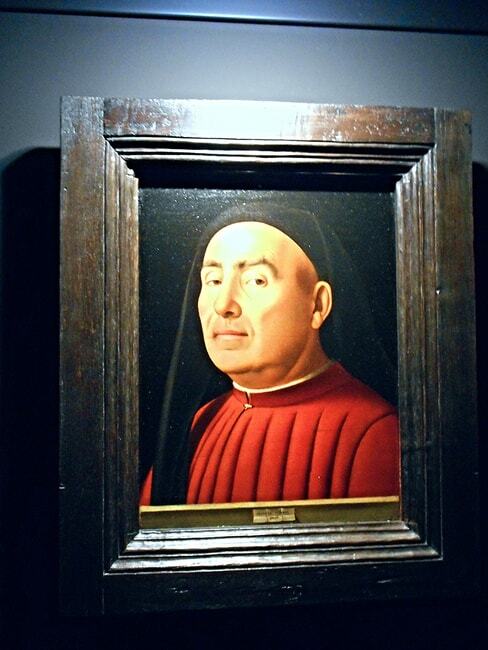 Antonello da Messina (active 1456–1479), was a Sicilian painter who had a major impact on Venetian art during his short stay in Venice between 1475 and 1476 – he is widely credited as bringing oil paint to the city, as well as imparting Flemish concern for detail and realism. Portrait of a Man (1476) encapsulates da Messina’s unique conflation of Italian Renaissance and Nordic style. It is the penultimate painting in a series of sublime portraits the artist completed in the final decade of his life. This painting depicts Pietro Micca, a Piedmontese artillery soldier who became a national hero for his military service during the French siege of Turin in 1706. During the siege, Micca orchestrated an explosion that meant sacrificing his own life in order to protect a key entry point of Turin’s citadel. The patriotic heroism of this soldier quickly became legendary, and during the 19th century in particular, iconography was widespread. Micca was the 19th-century poster boy of sovereign allegiance during the reign of Charles Albert of Sardinia and in the context of Italy’s First War of Independence. Artist Andrea Gastaldi’s painting is perhaps the most famous depiction of the hero. Gastaldi captures Micca moments before he sets fire to the mine of the citadel. The arrangement is idealistic and moral – amid the dingy mine, the soldier is cast in light as he kneels in servitude with an upward gaze. This painting is as evocative as it is historically interesting. Michelangelo Pistoletto (b. 1933) is one of the great exponents of the Arte Povera movement that rose to prominence in Italy at the end of the 1960s and early 1970s. 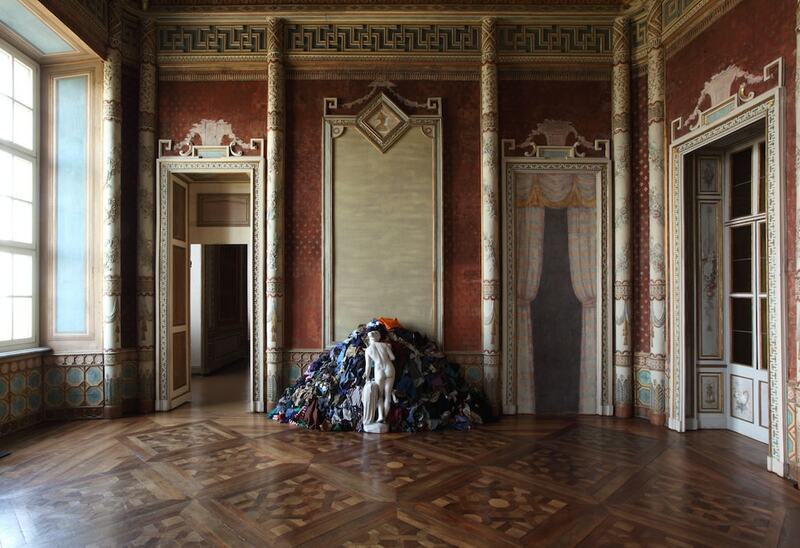 In this work, a reproduction of a classical sculpture of Venus stands before a mound of rags and old clothes. The elegant white statue alludes to the purity and erudition of classical world, which is at odds with the chaos of contemporary culture as represented by the colourful heap of fabric. This dichotomy functions as a critique of Italy’s supposed outdated and elitist high culture. Venere degli stracci is one of the artist’s most iconic sculptures and at the time, captured the sentiment of the western world’s 1968 aesthetic and political revolution. In one of Castello di Rivoli’s most elaborate halls, designed by baroque architect Filippo Juvarra, hangs a taxidermy horse. 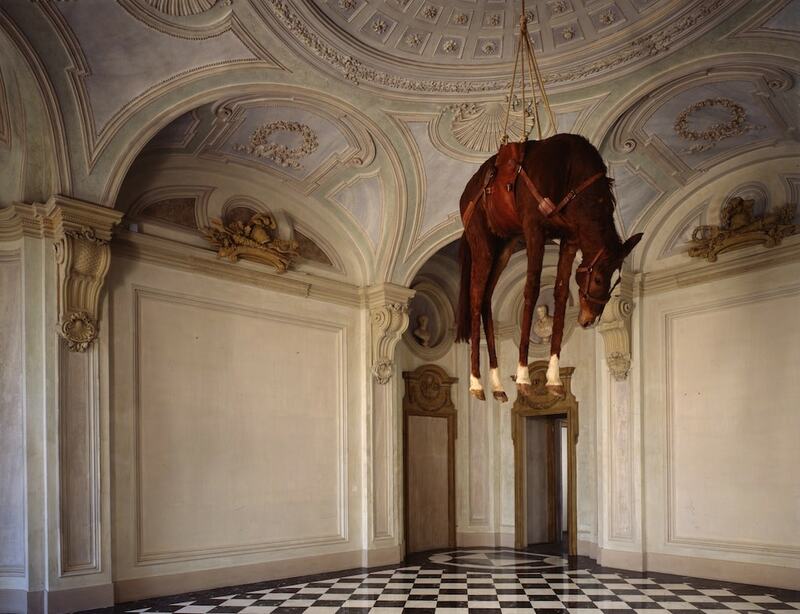 This is Maurizio Cattelan’s seminal 1997 work Novecento. The noble animal’s head droops and its legs are elongated as if being pulled down. Suspended (or perhaps trapped) in a harness, the limp body of such a powerful and fast creature evokes a sense of futility – all of its energy is immobilised. Presented in the highly decorative and period space it is a new take on the traditional still life.